Horseradish: An oft-used bitter herb. Though the bitter herbs of the Bible are not specified, the term likely refers to chicory, endive, coriander seeds, horehound, sow-thistle, and wild lettuce. Herbs, plants, and spices are mentioned throughout the Bible. Examples include hyssop, lavender, and rosemary. As for the bitter herbs of the Bible, there are three references in the Old Testament: Exodus 12:8, Numbers 9:11, and Lamentations 3:15. As for the Maror or bitter herbs, they serve as a reminder of the embittered slavery experienced by Jews in Ancient Egypt: "The fourteenth day of the second month at even they shall keep it, and eat it with unleavened bread and bitter herbs." (Numbers 9:11) The most common bitter herbs used today are lettuce and horseradish. Exodus 12:8 states "And they shall eat the flesh in that night, roast with fire, and unleavened bread; and with bitter herbs they shall eat it." Chicory, coriander, dandelion, sow-thistle, and wild lettuce were likely some of the original bitter herbs, given their availability in the Sinai Peninsula and Egypt. Other plants recognized as "bitter herbs" however, include mint, sorrel, horehound, wormwood, and watercress. The following herbs qualify as bitter herbs, though not all of them are "original." Chicory: (Cichorium intybus) A perennial herb dating back more than 5,000 years. It's mentioned in various writings, including those by Virgil, Ovid, Pliny, and Dioscorides. It resembles a wild weed, with twig stems and cornflower-blue flowers. Also known as "succory" and "blue succory." Dandelion: (Taraxacum) Believed to date back more than 30 million years, it is likely one of the original bitter herbs. Regarded as a weed, the dandelion is defined by its golden florets, parachute balls, and "toothy" leaves. Endive: (Cichorium endiva) Rich in vitamins and minerals, endive can be cooked or eaten raw, as in the Passover Seder. It is believed to be one of the original bitter herbs. Hawkweed: (Hieracium) A perennial weed defined by yellow, orange, or red flower heads. Its fuzzy stalk and overall look is similar to the dandelion. Horehound: (Marrubium) A rugged perennial listed by some to be an original bitter herb, given its availability. Its genus name Marrubium is believed to be a derivative of the Hebrew word "marrob," meaning "bitter juice." 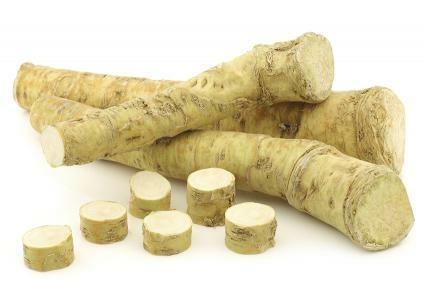 Horseradish: (Armoracia rusticana) A root dating back 3,000 years and along with lettuce, remains the most common bitter herb used today for Passover. Other names include "mountain radish," "red cole" (in England) and "sting nose" (in the United States). Mint: (Mentha) An aromatic perennial herb that includes 25 or so species. Possibly one of the bitter herbs referenced in the Bible. Heat can turn mint bitter. Sorrel: (Rumex acetosa) Likely one of the original bitter herbs. The plant's juice is sour to taste, due to ascorbic acid. Also known as Spinach Dock. Sow-thistle: (Asteraceae) An annual herb characterized by a yellow flower head and spiny leaves. The stem contains a milky sap. Also known as "milk-thistle" and likely one of the original bitter herbs. Watercress: (Nasturtium officinale) A perennial plant, one of the oldest known. High in iron, it is pungent to taste. Related to mustard greens. Wormword: (Artemisia absinthium) A perennial herb known for its bitter taste. Mentioned in the Bible in Lamentations 3:15 -- "He hath filled me with bitterness, he hath made me drunken with wormwood." Finally, there's wild lettuce (Lactuca sativa), which dates back to Ancient Egypt and was most certainly one of the original bitter herbs of the Bible. For Passover, lettuce typically occupies the Chazeret place on a Passover Seder Plate. It remains the bitter of choice for Jewish people in Egypt and Arabia. As said, everything concerning Passover relates to symbolism and the use of Romaine lettuce is no exception. This particular lettuce isn't bitter to taste at first; in fact, it's sweet and fresh. However, the longer Romaine lettuce is left in the ground, the more bitter its flavor becomes. This makes it a perfect Passover Seder bitter herb, as it symbolizes how life for the Israelites became increasingly bitter under Egypt.